There’s a whole ‘nother kind of Chicago bull coming to town. Introducing the Great Bull Run, a real-live, run-away-from-the-snorting-things event that’ll be careening around the Hawthorne Race Course on July 12th, selling tickets now. 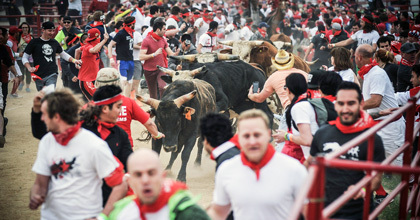 Founded by two attorneys who apparently fear neither bulls nor lawsuits, the Run is modeled after the Encierro of San Fermin — that same festival made famous in Papa Hemingway’s The Sun Also Rises. The American version works somewhat the same: position yourself along the track with a few hundred thrill-seekers, then run like hell when eighteen 1,500-lb. bulls charge your way (check this video). The bulls are unleashed in herds of six. Dangerous? Certainly. Just means you’ll have to keep to your wits. Yes, there’s a waiver. Safety nooks throughout the course. Pro bull handlers abound. A full medical staff on hand. Afterwards you’ll celebrate life with a beer and the opportunity to join a thousand tomato-chuckers at the afternoon’s giant tomato fight.